When a weakened artery in the brain ruptures, blood flows into the brain, compresses the tissue and kills brain cells. This is a hemorrhagic stroke. About 75 percent of hemorrhagic strokes (13 percent of all strokes) occur within the brain itself. 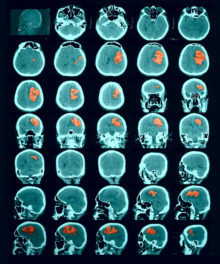 These are called intracerebral hemorrhages. Q: My husband recently had a hemorrhagic stroke, which the doctors told us was caused by a condition called cerebral amyloid angiopathy. What is cerebral amyloid angiopathy and how does it cause stroke? Q: I was shocked when my 75-year-old husband was caught in the act of shoplifting, as he has been scrupulously honest all his life. He was not criminally charged, but I’m worried. Could this behavior be related to his mild cognitive impairment?